At Auden House we provide 24 hour personal care for up to 24 residents aged over 65 years. how you take your tea, coffee etc. aspects of your history you’d like us to be aware of, where you grew up, where you worked etc. 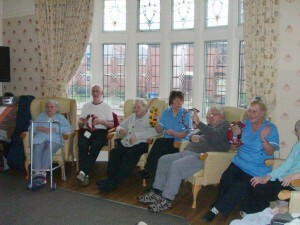 Day and night care staff are on duty to ensure that every resident of Auden House is as comfortable as possible. Whenever assistance is required, call points are installed in all bedrooms, and a care assistant will respond without delay whatever the time of day or night. Our bedrooms have a variety of facilities: All bedrooms have a vanity unit with hot and cold water; 18 bedrooms have an en-suite toilet; 3 of these en-suites also have an electric power shower with shower seat. Consultation: We constantly strive to improve our service and through regular meetings and satisfaction surveys we offer an opportunity for residents and their relatives to suggest ways we can improve. Of course, our staff are trained to handle complaints at any time, so we are always open to constructive feedback.